For my money, Echo Ladies debut album Pink Noise released on Sonic Cathedral was one of the best albums of last year. You haven’t heard it? 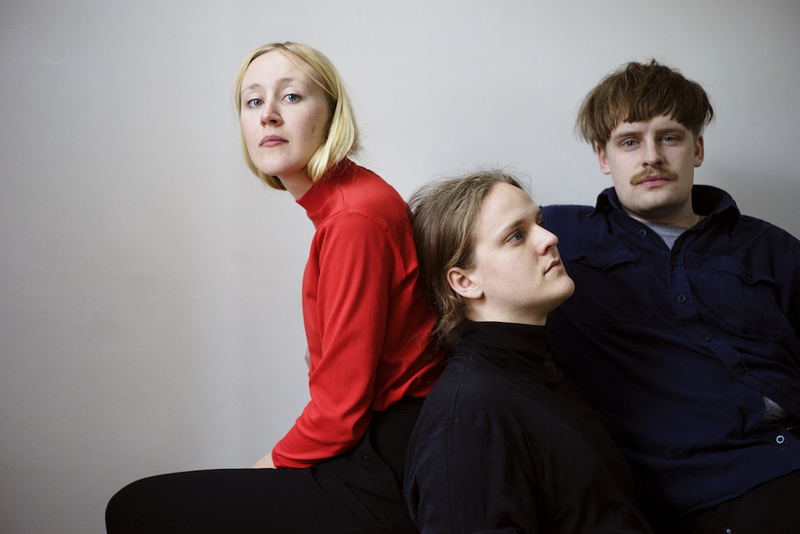 Well, the trio from Sweden carve out in one moment abrasive and scratchy yet at others; luscious, gaze pop, that whilst redolent of the late ’80s and early ’90s sounds of the 4AD catalogue and Jesus and Mary Chain, is invested with a magisterial bruised melodic intensity and brooding that one suspects only the Scandi winters can inspire. When the reverb coated guitar riffs, staccato drum machine, icy synths and the imperious vocals of singer Matilda Bogren collide, its an exquisite concoction. Following their album, they released a remix of their song ‘Overrated‘ by Robin Guthrie of Cocteau Twins﻿ and the circle was complete. This new year, we thought it was time we caught up with the trio for a review of their 2018. We’re good! Slowly getting ready to start a new year. 2019. Time flies. on vinyl. Really a dream come true for us. Releasing our debut album! A huge milestone for us. A year between recording and releasing, so pretty weird. but we’re really happy how it turned out. Sound, design and pressed on pink vinyl! What was the most unexpected thing to happen to you this year? Getting one of our songs remixed by Robin Guthrie from Cocteau Twins! We’re really proud of that. What was your favourite live show that you played this year? champagne and had great support acts: Wy and Stalker. You should check them out! What are your favourite albums of this year? What was your favourite single of the year? Probably our rehearsal space-buddies FEWS single ‘Business Man’. Wierd song but huge sound! What was the best live act you played with? Played with a lot of great acts this year actually. We had a great time with TVAM this october. Really enjoyed playing with Linda Guilala and Grimm Grimm in London this summer as well. Best live show you saw this year? We started the year strongly with seeing Slowdive in Copenhagen together. And Plan B here in Malmö have provided us with great bands such as A Place To Bury Strangers and Viagra Boys! Great shows all three! Don’t really know. Bird Box was quite intense, Bohemian Rhapsody was epic and Spike Lee’s BlacKKKlansman is not one to forget! Sharp Objects is definitely a must see! What new acts did you discover this year? Some Russian postpunk like Motorama and Buerak. And other great stuff: Snail Mail, Boy Harsher. Discovered that Soft Cells ‘Say Hello, Wave Goodbye’ is one of the greatest songs ever written! What was your favourite purchase this year? Some pedal or some vintage synthesizer! Who is your villian of the year? collect the car. The Sweden Democrats have earned a shout out as well. live and meet and audience! And Greta Thundberg! A true hero of our generation! Do you have any shows booked for next year? Nothing final yet, but we’re working on it. Do you have any songs recorded or releases planned for 2019? We’re testing out some ideas but nothing to record yet! What are your new year’s resolutions if you make them? Let love rule! And stay together!